The NASCAR Camping World Truck Series contends its only road course race of the season on a rare Sunday date, running the Chevrolet Silverado 250 at Canadian Tire Motorsport Park in Bowmanville, Ontario, Canada, this Sunday. Austin Cindric, then a Truck Series regular, won last year’s Chevrolet Silverado 250. He’s not entered in Sunday’s race, as he’ll be spending the weekend at Road America in Elkhart Lake, Wis., for the NASCAR Xfinity Series race there. 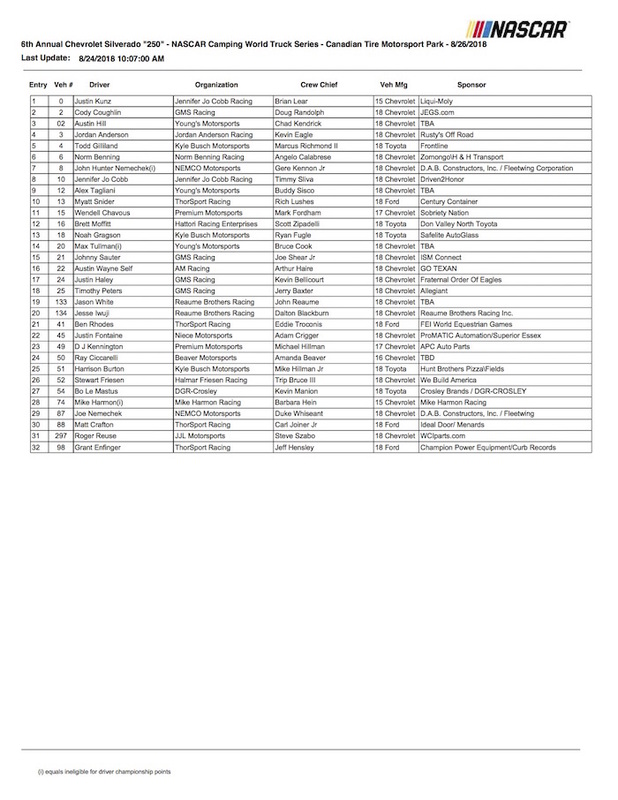 But John Hunter Nemechek, now a part-time driver in the Truck Series and the 2016 race winner at CTMP, is on the entry list. Qualifying for the Chevrolet Silverado 250 is scheduled for 6 p.m. ET Saturday and will be shown live on FOX Sports 2. Live race coverage will be on FOX Sports 1 on Sunday, with the race scheduled to take the green flag at approximately 2:30 p.m.